The BENEFIT of this Single Family Home in Plymouth with Plymouth/Canton Schools on very large fenced lot... FOR LEASE. 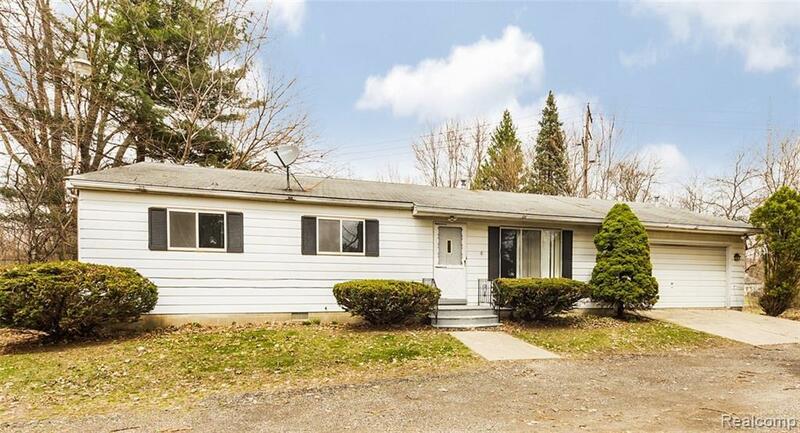 Ranch on large private and fenced lot. 3 bedrooms, 1 full bathroom, living room, dining area, kitchen, laundry room, large 2 car attached garage with opener, ample off-street parking. ZONING allows this to be a live/work home. ALL kitchen & laundry room appliances included. This house sits on a nice lot... so if you want space you have it here and look no further. The house is very clean and move in ready. FIRST MONTHS RENT, 1 1/2 MONTH SECURITY DEPOSIT, $250 non-refundable cleaning fee due at signing. NO SMOKING IN RESIDENCE. PETS ARE NEGOTIABLE WITH FEE. W2 FROM PAST TWO YEARS; PAYSTUB SHOWING YTD EMPLOYMENT FOR PREVIOUS YEAR AND CURRENT YEAR, FULL CREDIT REPORT SHOWING ALL THREE SCORES, COPY OF DRIVER'S LICENSE, LISTING AGENT LEASE APPLICATION (DOWNLOAD FROM REALCOMP OR CALL L/O). Long Term = Discount.